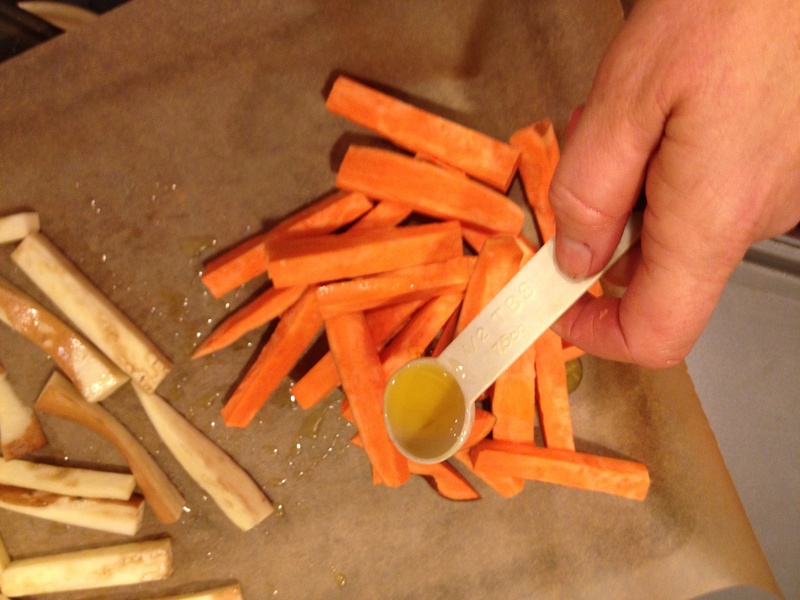 After reading a Nutrition Action article bursting the healthy halo around sweet potato fries, I got busy and recorded how I make Roasted Sweet Potato Sticks. While not an exact replica of a crispy fry, they are a darn good-tasting substitute for the high-fat, high-salt, high-sugar dish cropping up in restaurants these days. So if you’re tired of being misled into unhealthy eating, take a stand and do something different. Make your own food, it’s revolutionary! 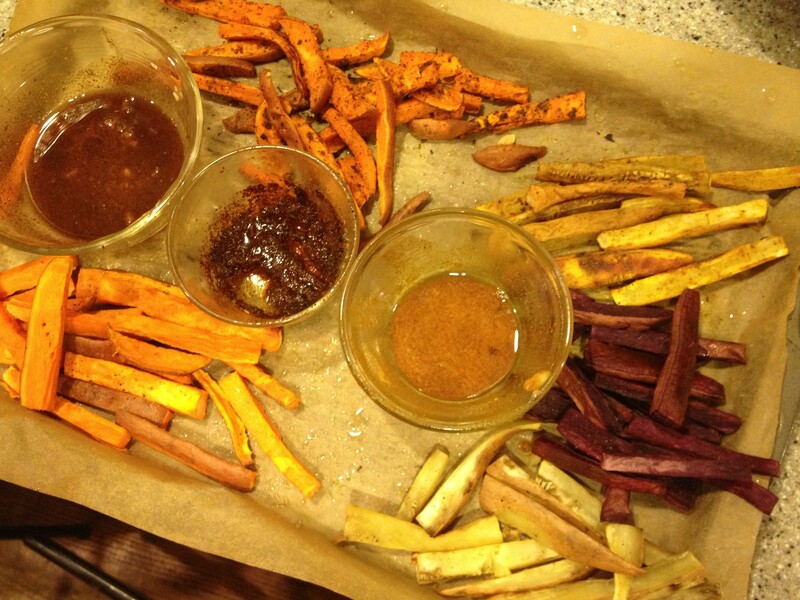 It doesn’t take much oil to transform sweet potatoes into a delightfully different side dish. Certain varieties of sweet potatoes are labeled as “yams” in regular grocery stores, but actually they are sweet potatoes. Yams are from an entirely different plant family, are grown primarily in places like Africa and don’t appear in our country except in an international market. Jewels and garnets (far left and far right) are pretty similar, with a fairly mild but good taste. As its name suggests, garnets have a more reddish tinge, both inside and out. Despite their pale color, white sweet potatoes are quite flavorful. 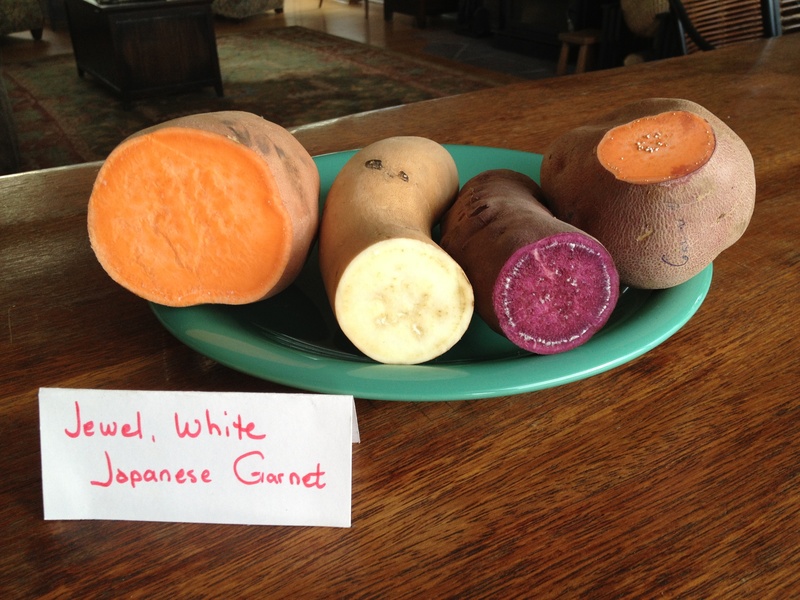 Potato Varieties In our healthy meal making classes, we taste test baked sweet potatoes and in those contests, the yellow-fleshed Japanese potato always wins. However, sweet potato fries are roasted at higher temperatures which makes the moister, less dense garnets and jewels more suitable. Whites become almost mushy with the high temperatures and Japanese are almost too dense and rich. But test it out for yourself, too, knowing that practically anything roasted will come out pretty darn good. Quantity Equivalents Depending on the variety, a medium-sized potato will be anywhere from two-thirds to a pound in weight and will yield between two and four cups of sticks. Organic? Sometimes sweet potatoes can be fairly tasteless. Sticking to organics has minimized the tasteless problem considerably for me. 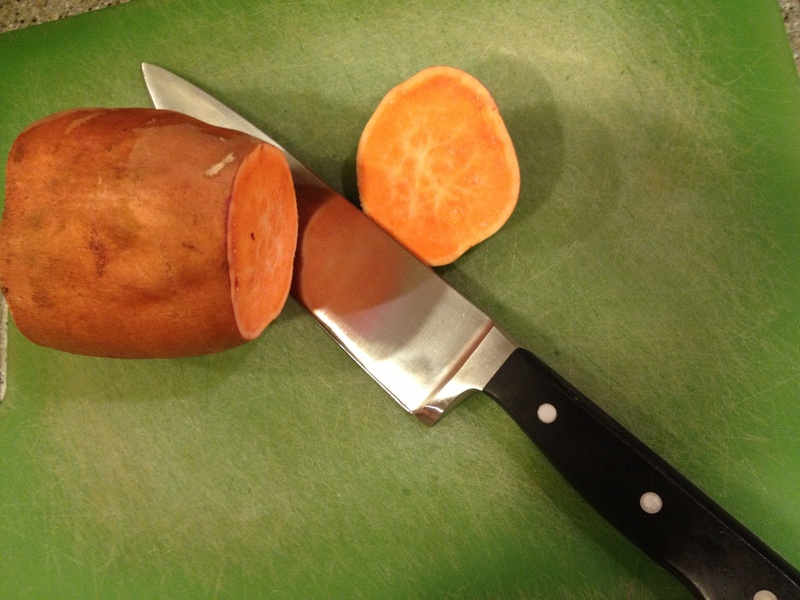 Cutting sweet potatoes: a chefs knife is the best tool. Sweet potatoes are just plain hard. Don’t try cutting them with anything less than a heavy chefs knife. Cut off the pointed ends first and roast separately in a small baking dish. The centers can then be cut into more uniformly-sized sticks, which promotes even cooking. Cut into slabs, then sticks as uniformly-sized as possible. Cut into slabs, getting to a flat side as soon as possible, then into sticks. Join one of our knife skills classes to learn more about safely and efficiently cutting vegetables and fruits. 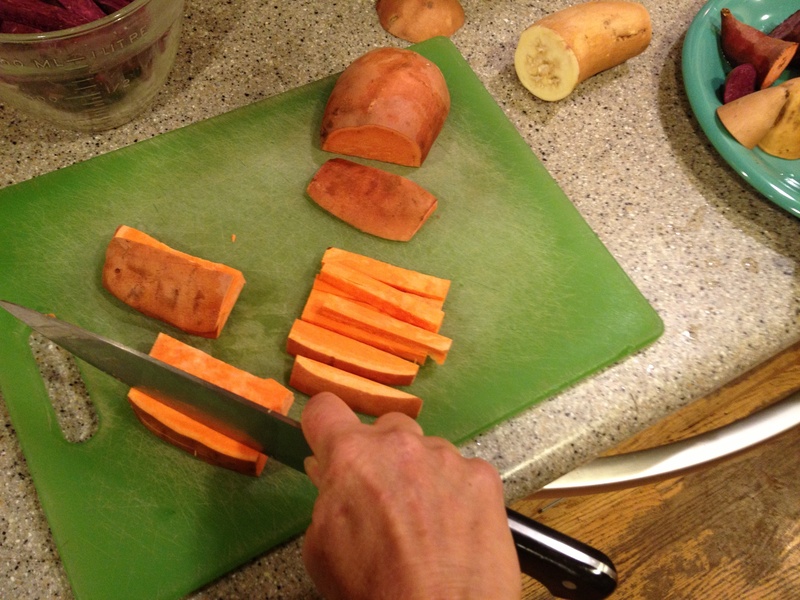 The flesh of white sweet potatoes darkens once cut and exposed to air, so work quickly to get them into the oven. However, should they darken, it does not affect taste or food safety. Pans and Parchment Paper Rimmed cookie sheets keep sticks from falling off. In case your sheets are rusted, cover with parchment paper (preferably unbleached for environmental reasons) to prevent the off taste of an old sheet from permeating the potatoes. Salt and Pepper A good, unrefined salt makes a surprising difference in flavor. For an inexpensive experiment, try Vitamin Cottage’s Orsa salt. Savory Spice also has many fine varieties of salt. Because they are so packed with flavor, you can get by with less, reducing sodium intake. Give ‘Em Room Be sure to spread sticks evenly across the cookie sheet, leaving a little space between each. Crowded foods will steam rather than brown, so if necessary, use a couple cookie sheets. When baking sweet potatoes, temperatures are kept at around 350 (F) to maximize sweetness. However, roasting is done more quickly at higher temperatures. Depending upon your oven, experiment with an even higher, 450(F) oven and if you have a convection setting, see if it produces more flavorful browning. The potatoes closest to the heating element will brown and crisp the best, so when cooking more than one sheetful, rotate them halfway through the cooking time and be sure to flip the sticks as well. When Are They Done? The 15- to 20-minute guideline in the instructions is but a starting point. The actual cooking time will vary depending upon your oven, type of potato, number of cookie sheets, whether you use a convection setting, and so on. Most importantly, doneness is a matter of personal preference. That’s why the critical rule of cooking is test and taste, test and taste. Test with a fork to check for a tender interior. Then taste, checking to see how you like the roasted sticks. The first time you make them, consider roasting some for different lengths of time to see if you prefer them more or less cooked. Sticks Not Fries A crispy fry is difficult to obtain without deep frying. Because our creation is roasted rather than fried in a vat of grease, we called them “sticks” to avoid raising expectations that the end product will be an exact replica of the high-fat, high-sodium fries found in restaurants. It is instead a wonderfully tasty dish in its own category. Playtime One of the best things about Roasted Sweet Potato Sticks is how wonderful they taste for something so simple. So don’t feel compelled to do anything more, but if you get an urge to experiment and play, try a different sweet potato variety or use a sauce or rub either before roasting or as a dipping sauce. Some examples. . . .
Sauces, Sweet Potatoes and a Winter Salad: Ready to experiment? Join us to try all the varieties of sweet potatoes and sauces. Discover some new flavors and ideas to perk up your winter meals. We’ll also make a winter salad for some complimentary crunch. Cook together, learn together, make new friends in this hands-on class. Saturday, February 1 from 2:00 to 4:30 p.m.
To register, just complete the form below. We’ll send you a link for payment.